Bringing some Ben Franklin wisdom to disc golf: When in doubt . . . don’t! Golf had barely made its way to the United States during Benjamin Franklin’s lifetime, otherwise I’d be inclined to think that the above quote, taken from his Poor Richard’s Almanac, came to him while playing a round. I also believe that Franklin, if born into a world where both ball golf and disc golf existed, would undoubtedly have chosen the later. Add that to the long list of reasons why he is by far my favorite among the founding fathers. 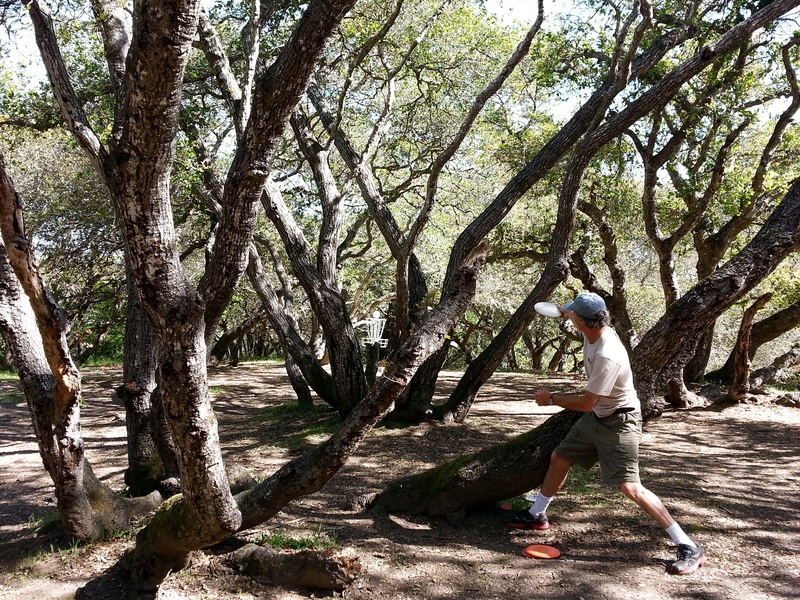 I could write an entirely separate post listing and elaborating on the reasons he would favor disc golf – chief among them it’s accessibility to people of all classes and the endless intriguing flight path possibilities of a flying disc. But that is for another day. Let’s focus on that quote, and how it applies to disc golf. 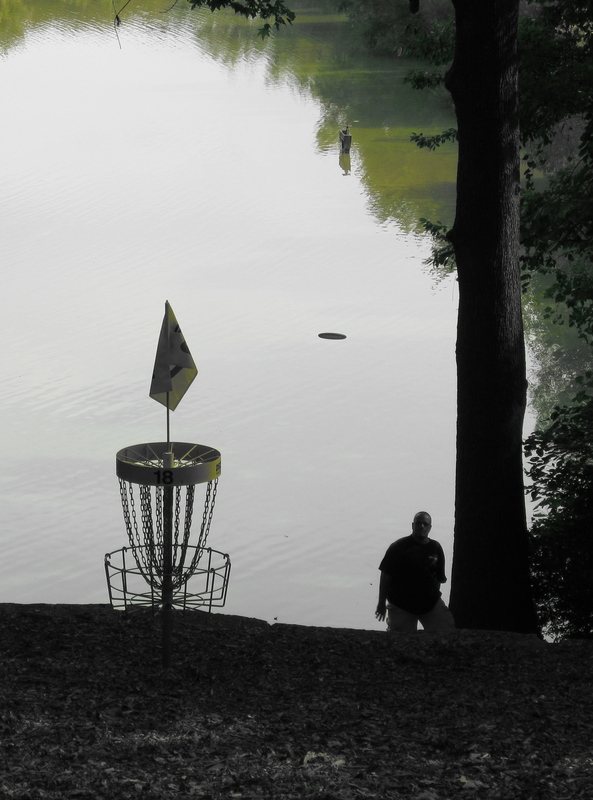 You’re 30 feet away from the basket with a downhill putt where the terrain continues to slope down behind the basket with a lake at the bottom. You know this hole well, and as you approach your lie you think of the many times you’ve hit this putt and others like it. You place your mini on the ground and begin to line up for the putt when thoughts of the possible results of a miss begin to creep into your mind. A player attempts a comeback putt on hole 18 at Winthrop Gold in Rock Hill, SC after missing his downhill birdie run. Photo by Jack Trageser. Choices abound on this shot. Hit an early branch and this player may be just as stymied on his next shot. Whatever he decides, there is no room for doubt. Photo by Jack Trageser. In this case your initial reaction was likely based on emotion more than analysis. You’re ticked off that you hit that tree and want to save par to ‘erase’ the mistake, so your first impulse is to look for how that might be accomplished (“I can hit that hole!”) As your logical brain has time to process, though, it begins to come up with reasons why the risky option isn’t the best choice, and these reasons represent doubt. Example 1 and example 2 are both situations where it would be wise to take Benjamin Franklin’s pithy advice of ‘When in doubt . . . don’t’. There are differences between the two, but also one important similarity. In example 2, you haven’t ever really made your mind up. You’ve been debating the options from the time you saw your lie until right before you’re expected to throw. You’re trying to talk yourself into the risky play due to an emotional response, but the logical side of you demands to be heard as well. I suppose this is more uncertainty than doubt, but it amounts to the same thing: attempting a shot without full commitment and attention, when it requires both. In both cases, as with every shot in golf, successful players follow a specific sequence for every shot: First evaluate the situation and options, next make a decision and commit fully to that decision, and finally, execute that decision with 100 percent conviction and focus. You can’t expect to be consistently successful unless you do all three, in that order. There will of course be times when doubt creeps in. One’s own thoughts are slippery and hard to harness. But when that happens . . . when in doubt . . . DON’T! Remember, ‘discretion is the better part of valour.’ Wait, that’s Shakespeare’s quote, not Franklin’s, so forget I mentioned it. If you want another Ben Franklin quote that can be applied to golf, consider ‘Honesty is the best policy’ or ‘He that is good for making excuses is seldom good for anything else’. I’m tellin’ ya, Ben Franklin would have loved disc golf. Go ahead and write that post about BF, man, I look forward to reading it! Thanks Richasaurus- I’ll add it to the queue. Although not everyone may be the Ben Frankin fans we are!